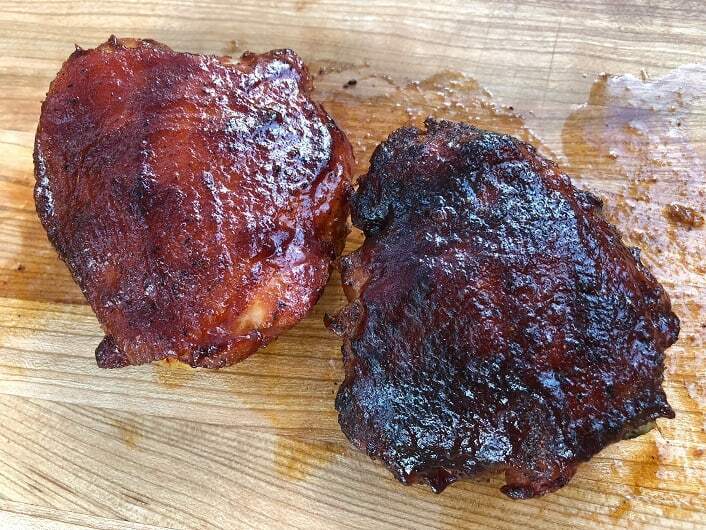 Smoked chicken thighs are an easy and CHEAP way to feed a crowd some great barbecue. The one thing you have to figure out though is how you are going to deal with the skin. Do them wrong one way and the skin comes out like leather. Do them wrong another way and the skin comes out like rubber. Do them like they do in competitions and you will never want to cook thighs again. Hang with me here and I will show you a SIMPLE way of smoking thighs that has delicious skin and will make you excited to put these on your pit any time a crowd needs feeding. You are never going to get crispy skin on a smoked chicken. The temperatures that we will be working with are just too low. What you aim for with thighs is skin that is so tender that you can cleanly bite through it. 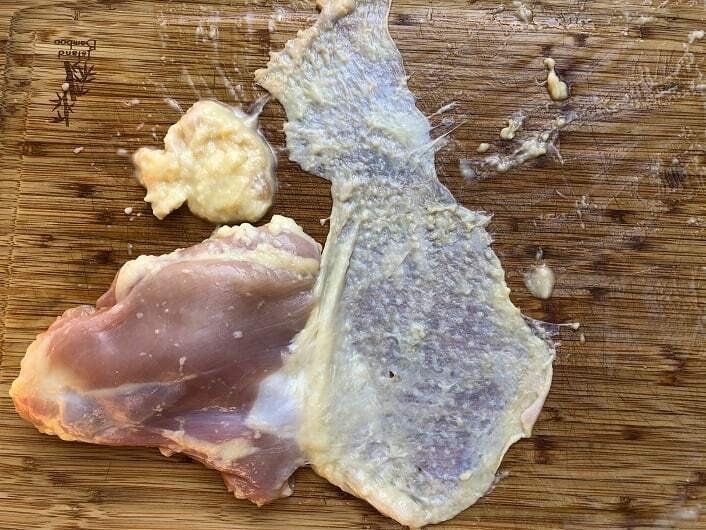 The standard way of getting tender skin of thighs for a barbecue competition starts by peeling back the skin and scraping all of the fat off the back of the skin until it is translucent. After the skin is scraped it is reapplied to the chicken and then the teams apply their secret rubs, injections, etc. Scraping the skin is a miserable job and is the last thing you will want to do if you are cooking a bunch of these for a crowd. Start by brining the thighs for at least three hours. 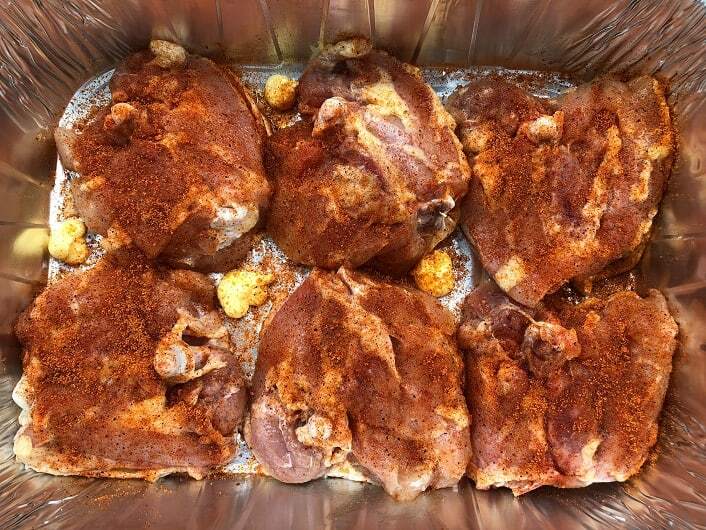 I used the brine recipe for chicken breasts for these thighs and let them soak for four hours in the refrigerator. Remove the thighs from the brine, pat dry with paper towels and trim. Flip the thigh so it is skin side down and trim the excess fat and skin away from the thighs. 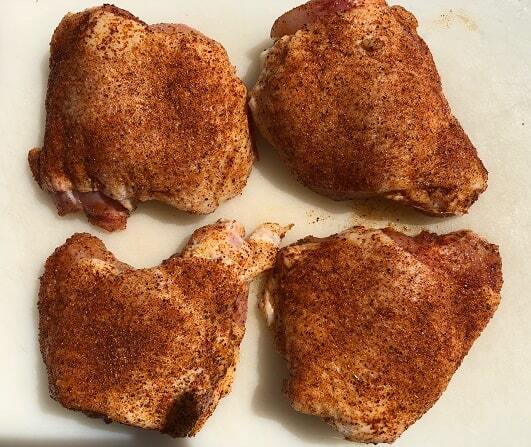 After the thighs have been trimmed season liberally on both side with your favorite chicken rub. If you don’t have a good chicken rub then you can use this recipe. Here is where the trick comes in! Get a disposable foil pan and add a tablespoon of Parkay or margarine for each thigh. Put the pan onto your smoker running at 250F. 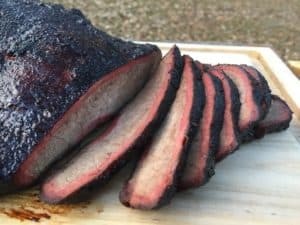 I like to use a blend of hickory and apple for smoke. When I was cooking these I went ahead and put some other thighs directly onto the grate for a comparison test. Let the thighs smoke for an hour at 250F. During this hour the skin is going to poach in the Parkay/margarine and get extremely tender. Let the thighs cook until they hit an internal temperature of 175F, about another 45 minutes. Once the thighs hit 175F I will coat them with some barbecue sauce and return them to the smoker for another 5-10 minutes so the sauce will set. My ideal final internal temperature for thighs is 180F. This is about ten degrees hotter than what I target for smoked chicken legs and is about 20 degrees hotter than targeted for smoked chicken breasts. Both sets of thighs finished at about the same time. The foil pan does not speed up the cooking process. 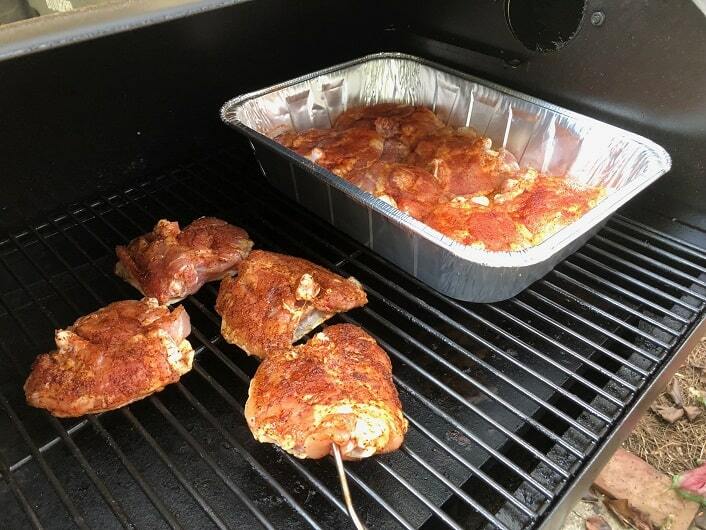 The thighs that were on the grate the entire time had a darker color since the rub had a better chance to form a crust. I was pleased with the color of both versions. The flavor on both versions were excellent with the foil pan thighs having a bit of a “buttery” note. 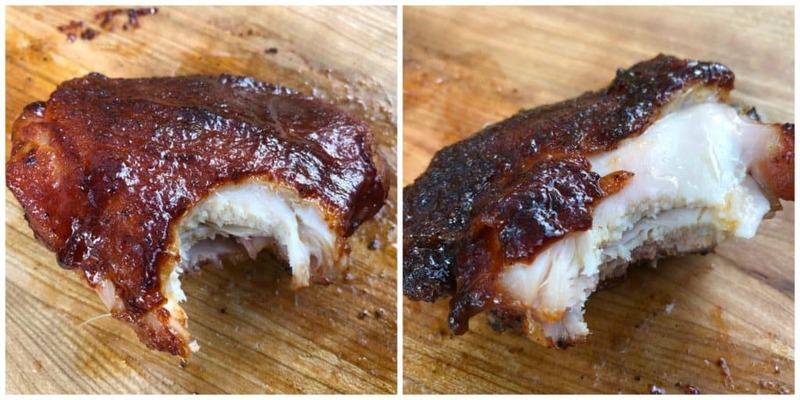 The skin on the foil pan thighs (left picture) was bite through tender and delicious. 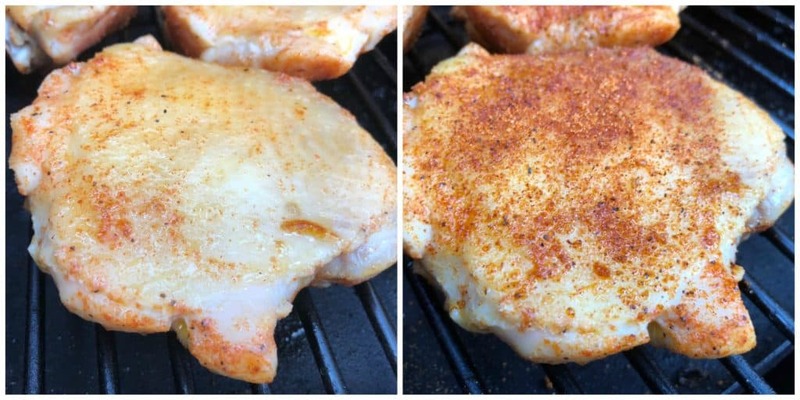 The skin on the regular chicken (right picture) was tasty, rubbery and almost completely came off on the first bite. Chef Tom from All Things BBQ shared this beautiful video showing how he prepares thighs for KCBS competitions. Very much worth watching! Pitmaster Harry Soo did some extensive testing of a bunch of different ways to get bite through skin. He shares them in this video. And last up is a different twist on competition thighs by Malcolm Reed. These are on point! Ive made these 4 times now and have tweaked the brine ever so slightly each time as it was a bit salty for us although we only do 4 thighs at a time which may be why. I dont alter the method though and they turn out awesome. Thanks for the recipe / method! So far, the best were 4 thighs brined in a ziplock for 45 minutes with just enough water to cover and about 2-3 tbsp of Cattlemans Grill Ranchero which is basically salt/garlic/herb. I dry rubbed with Plowboys Fin and Feather. Sauced with Lillies Q Carolina. I’m fairly new to smoking and I kinda butchered a brisket earlier and thought I would give it another try…..and idk if it was the recipe or my amazing grill master skills bu these things are amazing!!! Thank you for the help and I will def be making them from this recipe for years to come.